We live on a little lake in eastern South Dakota. We are “water people”. Our first purchase when we got married was a canoe. That was followed by a Hobie Cat sailboat and then a Balboa 16 sailboat. 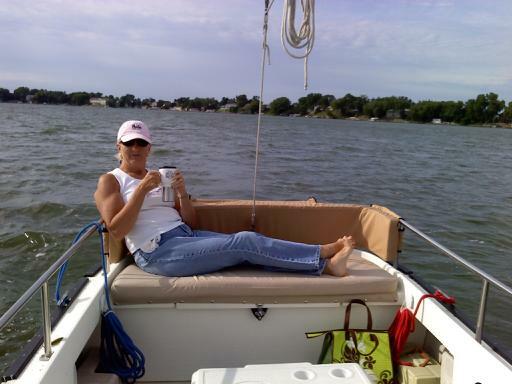 We sold the Balboa in 2010 and were looking for a motorized boat but not a “motor boat”. Tim drove by the boat lot in Sioux Falls and sent me this picture with the caption---"Here's our next boat". 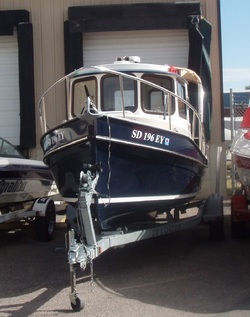 Of course that boat wasn't for sale but that is how we started our search for our own Ranger Tug. The tug in the photo is Popeye, a Ranger21EC, owned by Fred Gage in Sioux Falls, SD. He brought Popeye to Lake Madison after we got our tug, Nellie May, and we had a Tugboat parade around the lake. The reaction of the people on the shoreline and in other boats was priceless. The only thing cuter than one Ranger Tug is 2 Ranger Tugs! 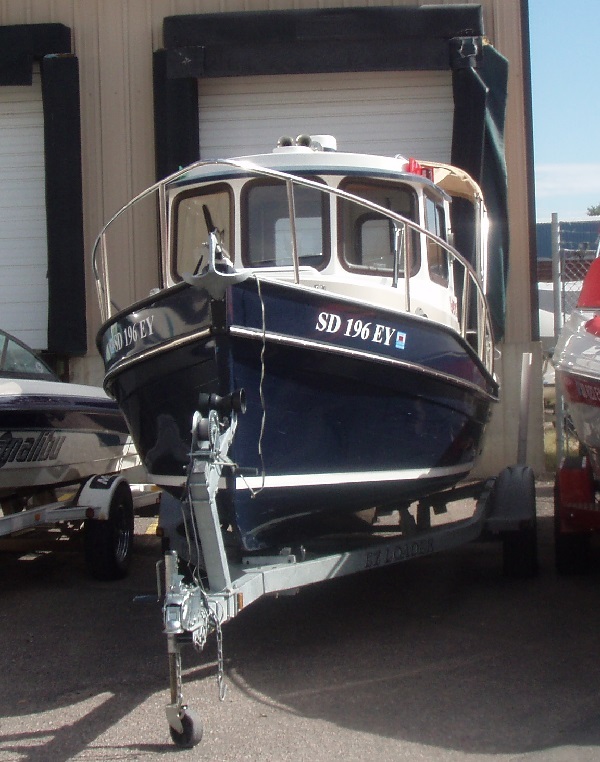 ​Through on-line searching we discovered there aren’t many used Ranger Tugs available in our size and price range. We discovered one for sale in North Carolina and contacted the owner for details. We used some frequent flyer miles to get to North Carolina and he took us for a test cruise. Yup, we bought the boat. It was so cute and would fit on a lift at our house and it wasn’t a speed boat. Excitement ran high as we flew home. ​We arranged to have the new tug delivered to South Dakota. While we waited the Great Name Debate started. The list was long and varied. But nothing really stuck until one day we were discussing how most boats either have a lady’s name or a quirky name. We weren’t keen on a quirky name so started thinking of names that would make us smile when we thought of the boat. A light went off! Tim’s granny, Nellie May, was the perfect fit. She was a pistol. Married at 14 to a rancher in the middle of South Dakota, lived in a converted railroad boxcar where she raised 3 girls and 1 boy. She was Tim’s biggest cheerleader from the time he could crawl. We had a name! 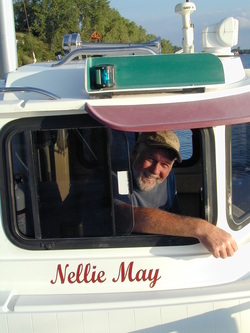 Nellie May lives on a Floe lift next to our Floe dock, ready for a Saturday cruise or a Sunday morning muffin run. We are known now as “those tugboat people” on our little lake. I do a lot of waving as I lounge on the Cleopatra couch. I enjoy readying while Tim is in the wheelhouse putzing around the lake. We have trailered her to other lakes in the area and always attract a crowd. The kids love “Little Toot” and adults question exactly what kind of boat we have. There is only one other Ranger Tug in South Dakota. The owner brought his Ranger21EC up to our lake one weekend and we had a Tugboat parade as we boated around the lake and waved to all the folks on the shore. Then we docked at The Broadwater and gave tours, answered questions and had a drink or two. We don’t have any plans to sell her since we enjoy having a boat available to head out for an evening cruise or dinner on the lake.